You’ve finally done it. You bought the land you’ve always dreamed of and now you want to build a barn so you and your horse can live at the same address. Deciding where to locate your new barn is the next big step and its a decision that should be well thought out. Building a barn is an expensive endeavor and once the barn is built you can’t move it around. There are many factors to evaluate when selecting the location to build your new horse barn. Having owned a number of different barn properties in my life I’ve learned a few things that will hopefully be helpful to you in your barn site selection process. In many cases I’ve learned the hard way, but often those are the most important lessons. One of the smartest things I did in selecting a site location for my last barn was to walk the proposed site location in a heavy rainstorm. I got wet, but the rain showed me exactly how the natural water drainage was in the area. Sure, I could have done some expensive terra forming to steer water away, but the more modifications you have to make, the more dollars you will spend. What you do not want is a barn located in a spot that collects water or you’ll end up breeding insects and live in a mud hole for weeks after a rain. If the only location available is a flat area with no natural, then bite the bullet and budget for bringing in fill that will elevate your barn. Bringing in fill and creating some swells to channel water away from your barn can make the difference between having a dry barn and a swamp. One of the best ways to ensure you have a location that drains well is to pick the high spot in your pasture. This works well in mild climates, but if you’re building a barn in the mountains in Colorado where the winds can be fierce in the winter, you might opt to build the barn not on the top, but on high ground below the crest of the hill so the hill can act to shield your facility from the direct winds. One other tip you might use in selecting your barn location is to look at your land in Google Maps with the terrain mode. It shows contour lines and you may be able to determine the high ground from the computer. You’ll still want to walk the property, but the computer could help you eliminate areas that might become bogs after heavy rains. You want your barn to be convenient to existing driveways and your home. There is a happy medium where it is close but not so close that your guests smell manure. Personally, I like to be able to look out my window and see my barn. My horses tend to congregate around the covered overhangs in front of my barn so I can easily check my horses without even going outside. Having the barn close to the house is also nice if I have to go out and feed after dark or if I have a sick horse and I’m coming and going a lot checking on the animal. Also consider convenience to your pasture or turn out when selecting the barn location. Growing up we had converted an old dairy barn on the property into a horse barn. It was not in a convenient location to our main pasture and made life a pain moving the horses from the barn to the turn out area where they spent most of their time. What I learned from that is that the dairy barn may have been convenient for the old dairy farmer because it was next to the road, but it wasn’t where the pasture was so the location was a daily hassle for us until we were able to build a fence that connected the barn to the pasture so the horses could go back and forth on their own. A few weeks back I spent the night with a friend in her barn doctoring a very sick horse. We had to run IVs all night and had to keep the horse sedated so we didn’t want to leave the horse alone. I was really glad the driveway ran up to the barn so people could come and go easily. The vet came by several times in the course of the 18 hours when the horse was in crisis (the horse had severe colic, but lived, but it was touch and go for awhile) – because it was so convenient, the vet could pull up to the barn door to bring us more IV fluid at two in the morning. Okay, so the hour wasn’t convenient, but I think the vet would have been less likely to come if she had to trek a mile into a pasture to get to the barn. A nice driveway or road that gives easy access to your barn can be a life saver. Its also nice when you are bringing in hay or horse feed not to have to carry it too far. It is unfortunate, but security is now an important consideration when selecting your barn site. I like my barn in view of my house so I can keep an eye on it. I’ve heard of break-ins into peoples tack rooms and of their trailers being stolen. I positioned my latest barn inside my locked pasture gate where they have to drive by my house to get to the barn. The times I’ve had problems with people coming into my barn is when I’ve had remote barns. Sometimes that isn’t something we can control. The best location may be out of view of the house, but if you have a choice its nice to have a good view of the barn. You can have a barn without lights and convenient water, but it’s a royal pain. You will want electricity and water at your barn so plan on it early. 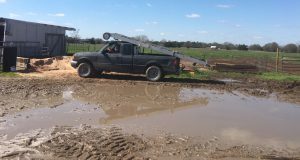 If you can position the barn where you can tap into existing water and electricity that will keep costs down, but usually getting utilities to the barn will require an additional pole or ditch dug. The closer you can position your barn to an existing source, the less you have to dig and the cheaper it will be. If two locations are equal in all other respects and one is next to a utility pole, go with that one. Are there existing hay barns or storage buildings on the property? How far away is your round pen or riding arena? You want the barn in a convenient location to your hay barn if you’re going to have to pull hay on a frequent basis. Consider these buildings in the overall plan. Today you may only be focused on getting your barn up. However, don’t limit yourself now by not considering at some point you may want to expand your facilities a bit. Pick a location that will allow you to add a riding ring or paddocks down the line. Who knows you may be the next owner of a fancy indoor riding arena. Somebody has to win the lottery, it might be you. Ideally you want to build your barn on a level piece of ground. If your property isn’t level naturally, you’ll need to bring in fill to make the location level. Site preparation is expensive, but necessary, so try to reduce how much fill you need to bring in by trying to find a fairly level spot to start with. My current pasture doesn’t have a level spot in it so I’m having to bring in about 180 cubic yards of dirt. It adds to my barn costs, but it should make the finished barn location level and with good drainage. People move around a lot these days. Something I see frequently is people forget to factor in the conditions of their current location and climate. I’ve seen people from the north build air tight barns in hot climates. They forget that the barn style and considerations that are appropriate for a cold climate are not the same considerations you would use in a hot climate. Try to keep climate conditions in mind when selecting where and how to place your barn. For example, when I built a barn in Kansas and Colorado I built for warmth. I wanted as much sun exposure as I could get so I positioned my barn facing south to take advantage of solar heating and designed a barn that had a solid wall against the prevailing winter wind. In hot Texas I had to design my barn and site selection completely differently. There I avoided facing the stalls to the West because of the hot afternoon sun and I tried to position the barn to capture prevailing breezes. With my Texas barns I always try to include 12 foot porches so the horses can stand in the shade but catch a breeze. My farrier loves the porch too – there is better light than in my center aisle and there is always a nice breeze. Know your zoning and HOA rules when selecting your barn and its location. For instance, one Texas town I lived in only let you put your barn behind the house (couldn’t even have it next to the house – had to be behind it.) Many zoning regulations dictate how close to the property line you can build and the size of the structure. I had one friend have to come back and brick her nice Morton barn because the HOA complained the barn didn’t match her house. If you’re one of the lucky people who have a nice view of mountains or woods, you want to make sure your barn complements the view. Selecting colors that blend with the country side or using landscaping to make your barn look integrated to the surrounding area, can keep your view lovely and make sure your investment enhances your property, not detract from the value. When we were getting ready to build our latest barn, we took several pictures of our back pasture and stitched the pictures together in a photo editor. Then we dropped in a scaled picture of the barn structure. We could move the barn around in the picture to see how the barn looked in different places on the property. It was a fun exercise and helped us find a workable location that didn’t ruin the view. Okay, this is one of the last things we think about when we are looking at all the glossy brochures from the barn companies, but think about where you will put manure when you are making your site selection. Obviously you don’t want it in full view, you want it out back, so make sure there is a place that is convenient for your manure pile. I like to make sure there is truck access to the pile because I have a number of friends who will come and take manure regularly if I make it convenient. I’ve done this in several barns now and never had a large manure build up. Make it easy and they will come. Having a horse in your backyard can be one of the most enjoyable elements about owning a horse. I find my blood pressure drops just by looking out the window and seeing my horses grazing peacefully. Building a barn and placing the barn in the best position possible can add to your enjoyment. Hopefully this article has stimulated some additional things to consider when selecting your barn site location.